The Irishman’s dog was part beagle and three or four parts mischief. It sniffed curiously around our legs as we chatted in the early morning sun. Our rods were set up and held comfortingly at our sides. Victor lived in his “chalet,” with its carved wooden eagle, on the east bank of the Maruia River, surrounded by stands of thick manuka and hills of native bush. He worked his farm alone and loved to chat when passing anglers called in. As we talked of weather, his state of health and the need to sell the farm, the minutes ticked by, ﬁve minutes became ten then ran into thirty. We shifted from foot to foot, now impatient to be on the water. Both the river and Victor could be heard, bubbling enthusiastically, one with an Irish lilt. Courtesy held us through and the appropriate signal to leave was not given until Victor’s dog re-entered the scene. It snuffled up against Hank’s leg and then cocked his own. The steady stream that resulted was enough inducement for Wiper and me to chuckle and drift away towards the wooden stile that would help us over the fence and lead down towards the river. Hank hobbled slowly after us, shaking his sodden trouser-leg as he walked. 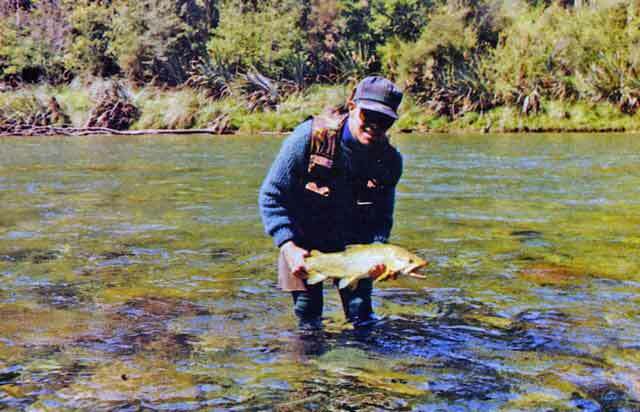 Nestled in the valley formed by the Victoria Range and the lee of Mount Rutland, this area of the Maruia is much favoured by anglers wanting to tangle with big browns in a scenic paradise. Local guides and their clients favour this section but their catch and release attitude ensures that there are always trout left for us less monied anglers. While access further down the gorge needs some ﬁtness, it is accessible and worth the tramp. Most angling writers seem to have less time for the section of the Maruia River upstream from here but my experiences show that, provided you put the hard yards in, there are trout to thrill throughout the river, nearly as far as Springs Junction. 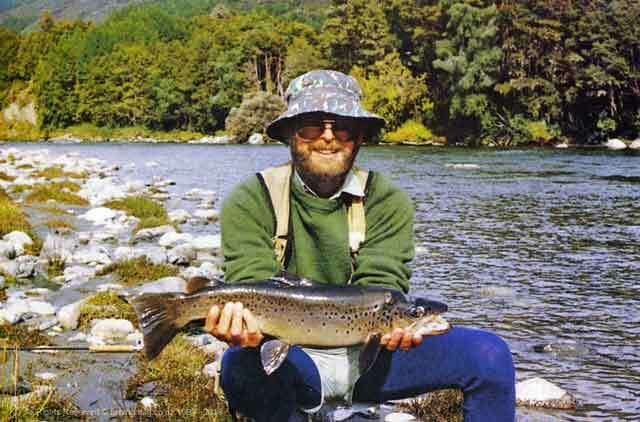 If you find the Maruia too imposing or simply feel like varying your angling then the smaller pleasures offered by the Rahu River, the Woolley River, the Rappahannock Stream and even the humble Warwick Stream are all within easy access. These are more delicate and fragile waters than the Maruia but will still challenge your patience and skills. Lighter leaders and more reﬁned ﬂy selection are required in these streams that are best stalked early or late season. Clear blue waters running over big smooth boulders typify the Mount Rutland section of the Maruia River, though upstream the water is more open, tends to braid and has more of a stony bed. Below the enchanting depths of the pool where the Warwick Stream joins the Maruia, the river rolls through a gorge that supports a close-pressing canopy of native bush, fern, toetoe and raupo. It is deep water in places and can be a bit imposing with a fly rod. However, the early season browns (and very occasional rainbow) seem to prefer to regain their energy and food from the edges and can be spotted, once you become accustomed to their lies and tell-tale green-grey heads. less timid of imitations. Generally, they can be taken from the near the edges and the quieter water with a biggish nymph. Under the water, the brown, grey and yellow boulders create distortion and camouflage that needs overcoming if you are to spot with success. 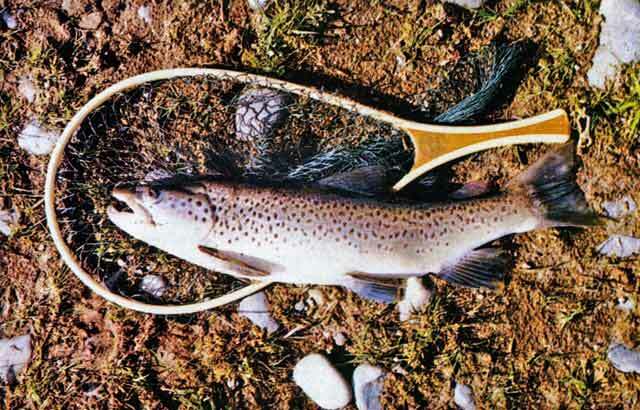 As the nature of this river varies throughout its length so does the colouration of its trout. Their ability to adapt to their surroundings produces coats of many colours. The photos accompanying this article (all Maruia browns) are three examples of the different conditions that may be found. Dave’s fish from down the gorge mirrors the yellow and tan rocks which predominate. Gray’s trout has the steel-blue sheen of a trout from above Crichton’s Road where the deep blue water and greywacke boulders are reflected in its livery. The trout with the landing net is from further up the river, where the braided ripples run over a shingle bed, lending themselves to the brown back and white belly. A size 12 Pheasant Tail, Hare and Pheasant, Hare and Copper, Green Stonefly and a Grey or Blue Darter have produced most regularly. Upstream in the rifﬂes and runs the Grey Darter comes into its own. It represents the swimming mayfly (Nesameletus) which is abundant here and is easily dislodged from the stony riverbed. Cast into the edge of the fast water or directly ahead of the grey shadows working on the inside of the drop-offs, the deeper the water the heavier the nymph. From below the Boundary Road bridge and through the gorge clearing colour in the Maruia can indicate that recent high water has shifted the large Green Stonefly Nymph (Stenoperla prasina) into the ﬂow. They are a very pretty nymph, a grass green body with distinct pinkish abdominal gills. Provided your fly has the body features, your cast is fair and delivers the ﬂy into the rougher depths the trout will generally not hesitate to investigate. From there the rest is up to you. Wiper is a master spotter of trout and on this river, it is an art that can often make or break the day. His relaxed and casual approach combined with lessons learnt during time spent in the Te Anau region has given him a major edge. I pride myself on having some ability to detect the often subtle shapes and movements that indicate trout. I was soon proved a novice. As we crept along the high bank and peered through the beech trees, Wiper unexpectedly dropped to one knee and carefully pointed his rod tip towards a blurry algae-coated stone. “A good brown feeding on nymphs,” he said. I chuckled to myself, until the blurry stone slipped sideways and a flash of white mouth blinked open then shut. 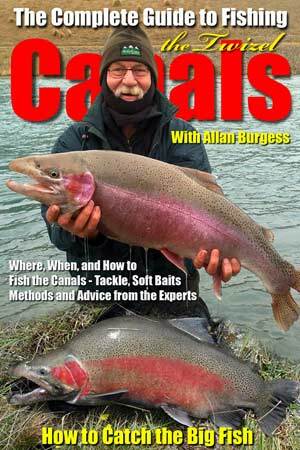 He gave no response, simply stripped line off and, after two or three false casts, the redhead Pheasant Tail pitched and sank to the bottom. A ﬂash of mouth, a tilt of the rod and the blurry stone erupted and tore across the stream. Four pounds of speckled brown was soon eased back into the flow, both the trout and I a little wiser. 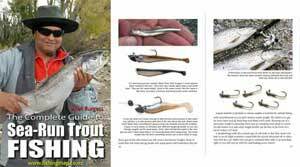 The trout are sullen and sluggish early season, but their high average weight tends to make up for this when they use the current and their curved body like a spinnaker, to drift side-on downstream. I have not landed a fish from here that was less than three pounds and one opening day saw nine trout banked averaging five pounds, the biggest was seven fat pounds. Many lack condition in the first months and this helps explain some of their eagerness to take what is on offer. But, as the saying goes, first find your trout. It is also hard to argue with the theory that trout are where you ﬁnd them. However, in the Maruia, you will find more trout if you know where they are more likely to be. Where the yellow and grey boulders and bigger stones hug the edge of the deeper guts the current is slowed, making an easy lie away from the rough and tumble of the centre flow. Where the rapids channel into the head of the deep slow glides, the quiet inside eye collects trout tidbits, again with the added benefit for the trout of ease of access. With the sun on the water and insects drifting through the shallower tails of the runs, the trout will also be seen swinging casually across the stone bed, often in full view of the steady angler. and his bare feet rested on the cold hard stones. enticing the trout to take any interest in the Countdown Rapala perch. As I spotted from the bank Wiper scrambled down into position and flicked the Rapala upstream, much in the same manner as when nymphing. The audience on the far bank craned forward on his crutches with interest. The first cast splashed close but the trout never ﬂinched as the Rapala ran down past him. The second cast was well out into the flow as was the third; as Wiper hurriedly retrieved the lure for another try the brown turned and sped across to take it without hesitating. The ﬁght was not inspiring and the sulky trout was soon drawn into the net. As he went to release it, Wiper spotted the eager boy across the water entranced by the action. “Would you like the fish to take home for a feed, son?” he called out. “Yes, thanks, mister.” There was no hesitation in the response. “We’ll come over at the bridge and bring it to you,“ Wiper shouted across, our hearts going out to him. However, before we had even gone a hundred yards, the boy had sprinted up the far bank, across the bridge and met us on our side of the riverbed. His crutches still lay unattended on the rocks as he sauntered off with an ear to ear grin and the trout swinging casually at his side. Ideal days on the Maruia involve lots of sun and clear skies. When these coincide with clear water they become days to treasure. Wiper and I were slowly working our way out of the gorge on just such a day. Where the small sidestreams tumbled from the bush we were assured of at least one trout feeding at the junction with the Maruia River. We would sit under cover, just short of the stream, and watch quietly from beneath the bush. As fantails dipped and twirled across the clearing so the trout would expose itself. A curl of tail or a white gape of mouth betraying its lie. While we would occasionally spook them, as often as not the fish would turn to the side and delicately pluck the nymph. It sounds easy but most things were in our favour and the principles applied are simple. By midday, we had returned to the Warwick Junction and rejoined Hank who had been whipping the upper stretch to a foam. We had a cup of coffee and a relaxed lunch beneath the tall manuka. We then headed further upriver to check the braided upper reaches. Here the willow starts to replace the beech and flocks of fat wood-pigeon are constantly on the move across the river, flopping heavily as they strip the fresh green tips of willow leaf. As the season quickens they will move onto the kowhai and take the lime green buds as they appear. As the Maruia cuts through the pasture it attacks and erodes the banks that keep it in check. Floods can carve great swathes through farmland as the torrent punches around curves. To counter this, great boulders of granite are formed into groynes to armour the more vulnerable spots and deﬂect the water’s power. And where the boulders are refuges from the flow are formed, there also lie the trout. In the quiet eddies and backwaters, each has its resident. nymph. Even as the fly line and leader cut through the surface in the strike, it was running hard for the middle of the river. It curved downstream and tore into the white water at the tail. No choice, either let it run me past the backing (which was already showing through the remaining ﬂyline) or join it in the water. The water was still chillingly cold with recent snowmelt but I floundered after it, slid off the boulder and ﬂopped into the water to my chest. The rod was high as I could keep it and the reel was whirring against my chest as I tried to slow the rush and paddle with my free hand. I made the rapids and the trout was still connected. It sat in the quiet water behind a rock; as it regained its strength I regained line. As I got it onto the reel it moved sluggishly, seemingly reluctant to re-enter the fast water. It was a heavy jack, six hopefully seven pounds, and finally, he ran again. This time I kept in touch as we both slipped and scrambled in the white water. He lay exhausted on the edge of the gravel and as I stooped to slip the net around it the nymph drew free from the thin hold of skin. The trout drifted slowly out of reach, gave a quiver then ﬂed to freedom in the dark current. We all sat on the bank at the tail of a glide swapping stories and watching the sun drop below the Victoria Range. Our rods were propped ready beside us. Circles from rising trout were spreading ever wider across the still surface in front. A magic day on the Maruia River, nearly complete.